FMSB Flange Mount, Smooth Bore, models are primarily fabricated using UHMW polyethylene. O-ring produces a seal around the standard 4-bolt pattern. PTTB model in FDA approved Delrin or Virgin Teflon (PTFE). Inner threaded to accept M12, M18 or M30 sensors; outside housing threaded to mate with standard NPT pipe taper. PTSB Models in FDA approved Delrin or Virgin Teflon (PTFE). Inner bore accepts 12, 18 or 30mm sensors and sensor secured via stainless steel band clamp. Outside housing mates with standard NPT pipe taper. SAE Models for 12 and 18mm sensors. Sensor is held secured with a stainless steel band clamp. 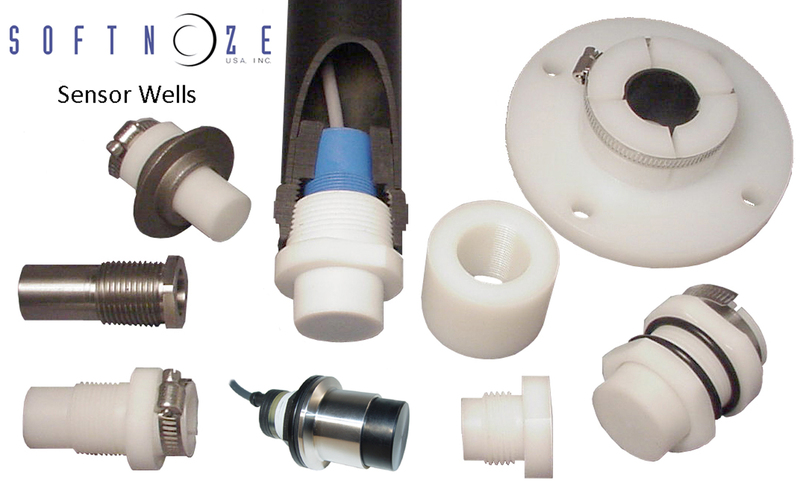 Outer housing is threaded and has an O-Ring that mates and seal with SAE-style threads. CTTB Ordered in Delrin or Teflon material types, depending on application. Secures sensors a length of conduit, which is then dropped into tanks and easily adjusted for level detection. BHSB Models supplied with a lock nut and dual O-rings for through-hole mounting in tanks. 30mm Delrin models are stock, all other diameters and or materials produced on demand. WOTB Models are welded (using a plastic welding rod) to etching and cleaning tanks. Stocked to hold M30x1.5 sensors. Specify material type; "PE" for polyethylene or "PP" for polypropylene.